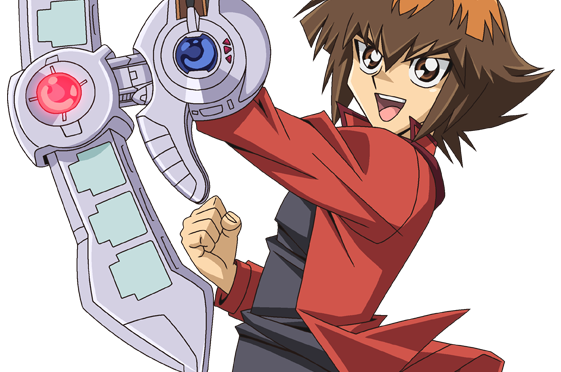 Judai Yuki (Yu-ki Ju-dai) / Jaden Yuki – Jaden Yuki is the main character, who has to live in the worst dormitory of the duelist academy, Slifer (Osiris) Red. 15-year old Jaden gets the rare Winged Kuriboh (Hane Kuribo) card from Yugi Muto (Yugi Mutou in the Japanese verson), the famous duelist from the original Yu-Gi-Oh! series. Jaden’s deck is a Elemental Hero series Deck. Jaden’s spirit partner is Winged Kuriboh. The Yu-Gi-Oh! GX anime begins with Jaden, intending to attend Duel Academy, bumping into the protagonist of the original Yu-Gi-Oh! series, an obscure Yugi Mutou, on his way to the school’s entrance examinations, being late and rushing. Yugi gives him a Winged Kuriboh card. Jaden receives a low score on the exam’s written component, and is therefore placed in Slifer Red, the lowest-ranked dormitory, alongside characters Syrus Truesdale and Chumley Huffington, who become his new friends. Jaden makes several enemies at the Academy, including Vellian Crowler, whom Jaden defeats in his examination duel. Out of spite, Crowler tries to kick Jaden out of school on many different occasions before finally beginning to respect him. Jaden is shown to be an accomplished duelist, defeating the aforementioned Crowler during his examination duel, Chazz Princeton in a school-wide duel, and Bastion Misawa for the representative position in an inter-school duel, both of whom received higher grades than he did and represented the higher-ranked dormitories. He also defeats most of the Shadow Riders. In the first season, his first major school sanctioned duel with Chazz awarded him a promotion to Ra Yellow, which he turned down in order to stay with his friends in Slifer Red. Chazz remained a rival for Jaden during much of the first two seasons, and became a friendly rival mid-way during the events of the Society of Light story arc. In the second season, Jaden ventures into an extraterrestrial realm known as “Neo Space” after being defeated in his second Duel with Aster Phoenix and losing the ability to see his cards. There he learns of the ongoing battle between the forces of darkness and light. With the help of the resident Neo-Spacians, Jaden adopts the role of the universe’s defender, wielding the “darkness of justice” against Sartorius and the Society of Light. He is charged with the task of rescuing most of his converted friends from the organization’s clutches. Jaden is also entrusted one of the keys to the mind control satellite of Misgarth by Sartorius’ good personality, and proceeds to purge the Light of Destruction from the diviner’s body. Jaden as Supreme King. In the third season, Jaden is pursued by a deranged Yubel whose dedication to its mission had long since warped into a sick obsession with Jaden, where on many occasions she announces that she loves Jaden. After one of his friends, Jesse Andersen, sacrifices himself in order to defeat the deranged spirit, Jaden goes on a rescue mission which forces him to confront his own feelings of inferiority and doubt. He succumbs to them, temporarily straying off the path of a hero by becoming the ruthless ruler of the third alternate dimension, the Supreme King. As Supreme King, Jaden duels and collects the souls of numerous innocents to complete the Super Polymerization card, but is rescued by Axel Brodie. Restored to his former self, Jaden confronts Yubel and taps into the power of Supreme King inside him to duel. Yubel then reveals that in a different dimension she was once a human who volunteered to become a monster to protect Jaden’s past incarnation as a king until he became an adult, whose alter-ego Supreme King was destined to wield the power of darkness to keep balance with the Light of Destruction. Jaden, forgiving Yubel, fuses her soul with his soul with Super Polymerization, absorbing her powers and vanishing as the different dimension closes. Jaden returns to the original world after a wish on a falling star by Syrus results in Jaden crashing back to Duel Academy inside a meteor. In the fourth season, Jaden has been fused with Yubel’s soul, and its power occasionally manifests in the form of bichromatic eyes. He is also more serious and brooding, much to the confusion of the other members of the main cast. Jaden decides to leave Duel Academy, not wishing to put his friends in danger of a threat he feels gaining in strength. However, both Sartorius and Kagemaru attempt to convince him otherwise, believing that he is needed on the island to prevent a growing danger in the near future. This seems to be well-advised, as before their meeting, Jaden already confronts a mysterious Obelisk Blue student by name of Yusuke Fujiwara, who can hypnotize people and set fires with his eyes, as well as a new darkness-controlling antagonist (or set of antagonists, as multiple copies of him are shown in the end of episode 158), Trueman, who seems to want both Jaden and Fujiwara dead. He also has to deal with the reemergence of Nightshroud, whose past may also tie into the mysteries behind Fujiwara and Trueman. Later on the season, Jaden goes in a hurry to Domino City because Axel Brodie told him that it was empty, and that it might be a Trueman action. Jaden, however, gets there too late, and has to face Trueman, who had taken control of Axel. After Jaden is cornered by Trueman, Sartorius saved him and had a duel with him. Jaden later dueled Jesse, but due to the “Arcana Force 0: The Fool” card Sartorius had placed in Jaden’s deck tainting his Polymerization card, Jaden believed he was facing Trueman. He eventually faces the real Nightshroud in a duel, and with the aid of Neos, the Neo-Spacians, and Yubel, manages to win. Now, on his Graduation Day, Jaden is challenged by the present-day Yugi, who indirectly takes him to the past for a true Graduation Duel against a younger Yugi. Jaden duels against Yugi until the Pharaoh Atem takes over Yugi’s body and summons Slifer the Sky Dragon. Jaden in return sends Neos into battle with the God Card. During his duel with Yugi and Atem, Jaden remembers the fun in dueling. It then pans to the desert. Jaden thanks Yugi for reminding him that dueling is fun. In the end, he is shown in a desert where he ends up traveling with Professor Banner’s ghost and his cat, Pharaoh, towards the upcoming adventures. Although the episode did not explicitly state the victor of the duel, it is implied that Jaden had lost the battle, having said in the post-duel that he still had a long way to go. Also, having fused with Yubel, Jaden has become a being unlike any other in the Yu-Gi-Oh! universe: half-human, half-Duel Monster, and is described by Satorius and Kagemaru as a being transcending beyond human limits. As stated, he gains inhuman powers on par to those of the Millennium Item wielders, especially Yugi Mutou and Ryo Bakura. His powers include materialization of Duel Monsters, immunity to hypnotism and other mental attacks. During the first year, Jaden plays an Elemental Hero deck composed of the eponymous series of monsters, Spell and Trap Cards and that support them, as well as his “partner” Winged Kuriboh which he received from Yugi. The design of cards in the Elemental Hero series is of American comic book origin, while the design of cards in the Neo-Spacian series is of Japanese origin. Jaden’s strategy is based on the various Fusions that are created through combinations of the Elemental Hero cards. As the series progresses, it is revealed that every Elemental Hero has a Fusion of some sort with another, giving the card Polymerization premier importance in Jaden’s deck. The majority of his other cards supplement his Elemental Hero monsters, such as the Field Spell, Skyscraper, and these cards have allowed Jaden to emerge victorious even in dire situations. After his second duel with Aster, Jaden’s entire deck is left blank to his eyes due to Sartorius’s powers. With the inability to use his old Hero deck, Jaden received a new one that included some cards he created as a child for a KaibaCorp contest. Once his ability to see his older cards returned, he combined elements from both decks into a single deck, his Neos deck. While this deck still contains many of the cards from his original deck, it also consists of Neo-Spacians and cards that exploit their ability to “Contact Fuse” with Elemental Hero Neos in Guyver-inspired fashion. One of the cards in this variation of his deck, Rallis the Star Bird, is based on an illustration by Kaori Kimura (Kimura Kaori?) submitted for a card illustration contest held earlier during the series. As the Supreme King, Jaden plays Evil Hero cards, vile incarnations of his regular Elemental Heroes. As opposed to the combo-oriented style of his normal Elemental Heroes, Jaden’s Evil Heroes rely on straightforward tactics such as monster destruction and overwhelming opponents with powerful Fusion monsters. After returning to normal, Jaden regained his Neos deck and after fusing his soul with Yubel’s, its card was added to it. Yubel can be fused with Neos to create Jaden’s most powerful Duel Monster, Neos Wiseman. His last new fusion monster shown is Divine Neos, a combination of all the Neo-Spacians and Neos himself.